Schools - Monona Chamber & Economic Development, Inc.
﻿Home of the Bulldogs!! 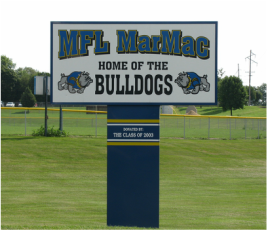 Monona is part of a unified school district, the MFL MarMac Community Schools, home of the Bulldogs. This district covers 166 square miles and is made up of communities in the Northeastern part of Clayton County and Southeastern part of Allamakee County. The district includes the communities of Monona, Farmersburg, Luana, Marquette, McGregor. The pre-kindergarten through third-grade Elementary and the 9 - 12 High School are located on the same campus in Monona while the 4 - 5 Upper Elementary and 6 - 8 Middle School are located in McGregor (approximately 12 miles east from Monona). Monona's campus also includes the Little Bulldog Center (constructed in 2007) which houses both daycare, Head Start, preschool, and early childhood special education programs. Also located in McGregor is a newly-renovated Dr. Smith Childcare Center (approximately 2 blocks from Middle School campus). For more information on the Smith and Bulldog Child Care and Learning Center, click on either link above. We Love Our 'DAWGS!! The MFL MarMac School District is an important part of our local communities providing academic, athletic, and cultural opportunities for all residents. Middle School students have a well-rounded variety of academic courses. In addition to academics, Middle School students are offered a variety of extracurricular activities which include band, performing arts, and athletics (football, cross-country, volleyball, basketball, wrestling, track, and cheer leading). The older facilities have been updated and regularly maintained. These upgrades include classroom modernizations and energy-efficient lighting and windows. The Board of Education constructed a running track in 2002, and upgraded the football field in 2009. A fine arts addition was built in 2003, a McGregor addition was added in 2004 to include office space, guidance, and student-centered conference rooms, and a weight-room/wrestling room was added in 2009. An modern auditorium was constructed in 2013. MFL MarMac School District with daycare and preschool combined has approximately 1,000 students. Of these students, 800 are in the K - 12 program. The school district received a “Breaking Barriers Award” from the Iowa Department of Education in 2011 for lowering achievement gaps. Our test scores are consistently at or above the state average, and our student-teacher ratio is below the state average. Our graduation rates average consistently at over 95 percent, and approximately 70 percent of our graduates attend post-secondary education.